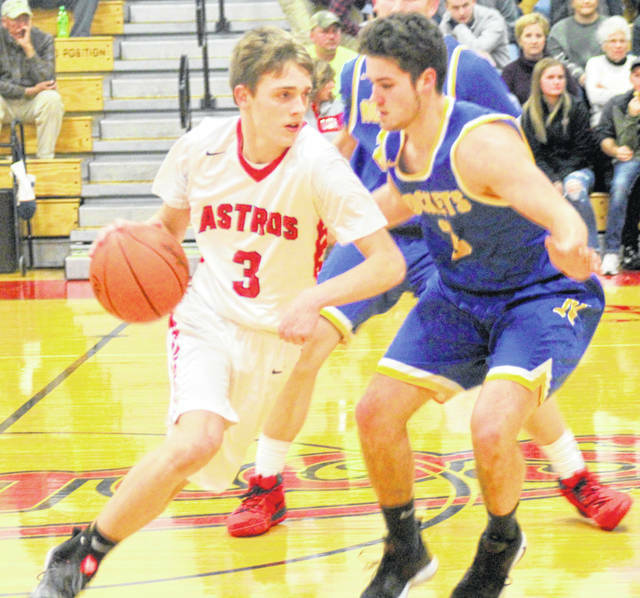 Branson Smith scored 20 points Tuesday for East Clinton against Clermont Northeastern. LEES CREEK – Led by Skyler Schmidt, the Clermont Northeastern Rockets rolled to an 80-42 win Tuesday over East Clinton in SBAAC National Division play at the EC gym. East Clinton is 0-12 overall and 0-7 in the National Division. Clermont Northeastern is 6-7 overall, 5-2 in the division. Georgetown leads the National with a unbeaten 6-0 record. Schmidt, a 6-7 sophomore post player, had 11 of his game-high 30 in the third period. Branson Smith led East Clinton with 20 points. The Rockets led most of the way. After holding a 33-22 advantage at halftime, Clermont Northeastern dashed any thoughts of an East Clinton comeback with a big third quarter. Behind Schmidt’s 11, CNE extended its lead from 11 at the break to 28 at quarter’s end, 57-29.